Where were you in 1985? 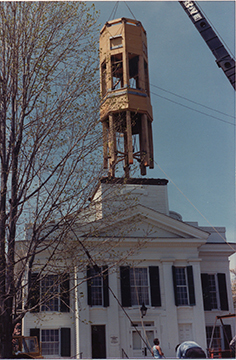 Since 1985, Bradshaw Construction has met the challenges of complex structural building, restoration and renovation as shown here during the reconstruction of the New Canaan Congregational Church bell tower and steeple. With the same skill and experience, we approach all our residential and commercial projects. Combining hands-on supervision, superb craftsmanship and meticulous attention to detail we strive to complete every project, no matter what size or scope, on time and on budget. It is important to us that the client and the contractors share a positive experience from the planning stages to the completion of this often daunting process. 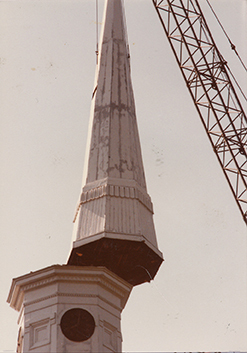 Removal of the old steeple and bell tower that had failed structurally. 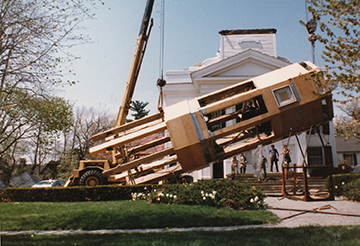 After prefabricating the new bell/clock tower on the ground it was hoisted into place. 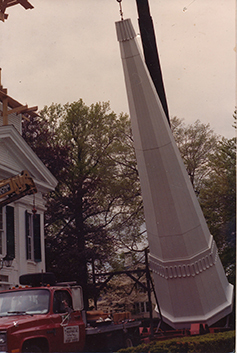 The aluminum spire was then installed. 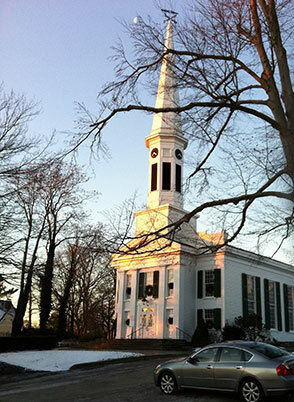 The church as it looks today.